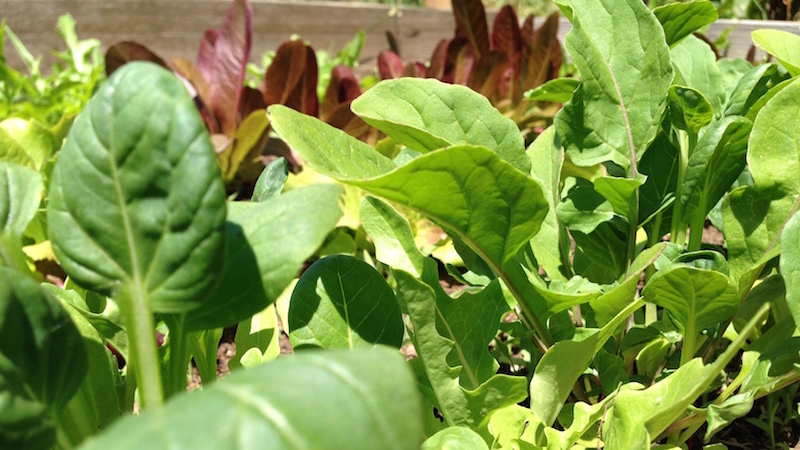 Garden 2015: Things Are Bustin' Out All Over! 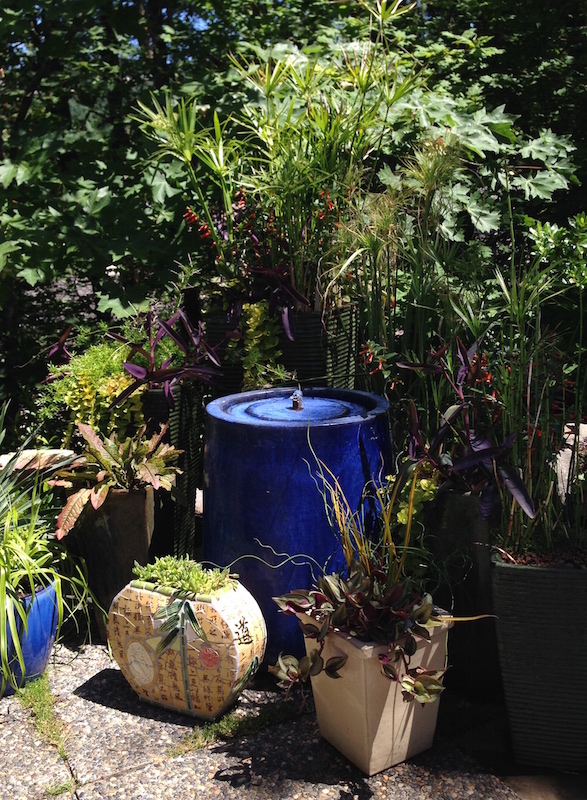 Garden Tours: A Perfect Excuse to Snoop! I prefer to call it aubergine, the lilting name that the French use for this member of the nightshade family, but say that to an employee at Whole Foods and you'll have a choice of the only-reserved-for-certain-customers official eye roll or the more traditional shoulder shrug. Botanically classified as a berry, it's a summer favorite of contributor Jim Dixon of Real Good Food, who believes everything tastes better cooked on his grill. I'm cooking outside as much as possible during this hot weather, and I try to make sure I have an eggplant on hand when I light the grill. 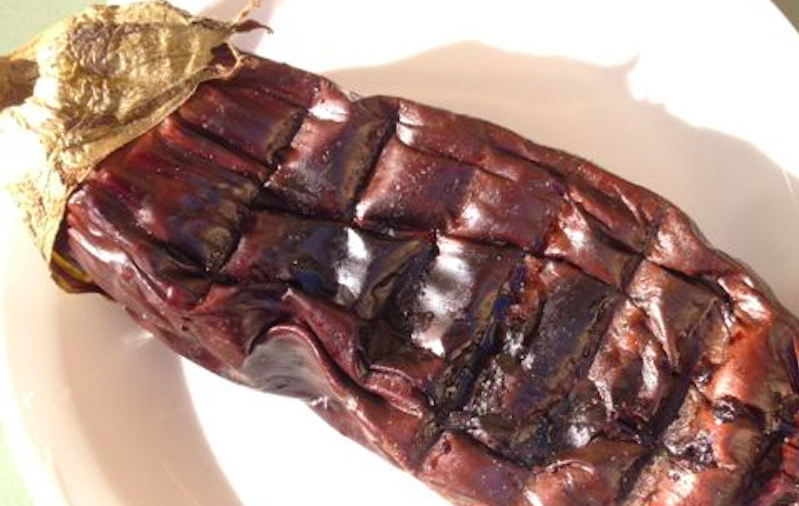 While you can roast eggplant in the oven, you don't get the smoky flavor you get when you burn them over fire. And I rarely build a fire just for burning eggplant; I'm usually cooking something else but want to take advantage of the hot coals. The technique is simple. Put the whole eggplant over the fire, turn it over periodically and cook it until the skin is charred all over and the eggplant has collapsed. The time will vary depending on the heat of your fire, but it's difficult to overcook (unless you literally burn it up). I've left eggplant on the grill overnight to cook slowly over the dying embers. When the eggplant is ready, let it cool enough to handle, then cut it lengthwise and remove the skin. Sometimes it just peels off, but you may need to use a spoon or knife to separate the skin from the cooked interior.The cooked eggplant makes great baba ghanoush, but I like to make a modified version of the eggplant salad found throughout the middle east. Chop the cooked eggplant coarsely, then combine it with chopped tomato, onion (sweet onion if you can find one), cucumber (thin-skinned cukes are best), mint, parsley, red wine vinegar (or lemon juice) and plenty of extra virgin olive oil. One year. 12 months. 52 weeks. 365 days. That's how long it takes till you know if you've succeeded or failed miserably. If you've created something worth doing again or if maybe it needs a little tweaking next time. Too strong? Too sweet? Too bitter? Still takes about a year to really know. Longer than a pregnancy, with no ultrasounds, blood tests or even a heartbeat to listen to. Sure you can taste it as you go along, which can give you a vague idea of its eventual character, but really, as with that pregnancy, you'll just have to wait and see how it turns out. In this case, if the combination of raw green walnuts, grain alcohol and simple syrup makes itself into something worth pouring for friends after a long, happy dinner. 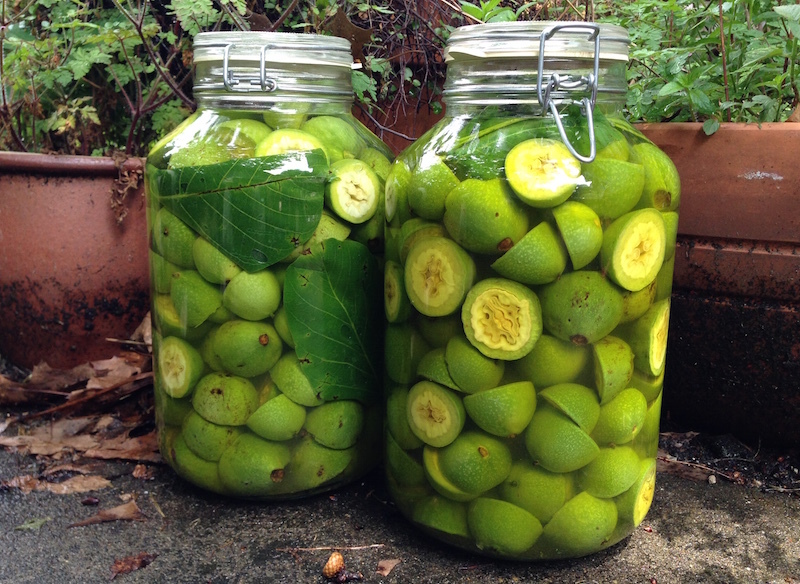 My first batch, made last year from walnuts donated from the prodigious production of my neighbor Jim Dixon's tree, got off to a promising start on our back patio, over a period of several months turning from bright green to yellow to the color of your car's oil when it needs changing. Once the solids have been strained off and the simple syrup is added, it's like tasting a soup before the ingredients have had a chance to cook together. Each ingredient was distinct and identifiable: lots of astringent alcohol, the vegetal taste of the walnuts, then the sweetness of the sugar. After a year, though, the flavors began to blend into a cohesive profile. At this point, last year's batch has subtle notes of chocolate and coffee, as well as vanilla and a hint of citrus. I know Jim has nocinos dating back several years, each remarkably unique and getting more complex as the years go by. 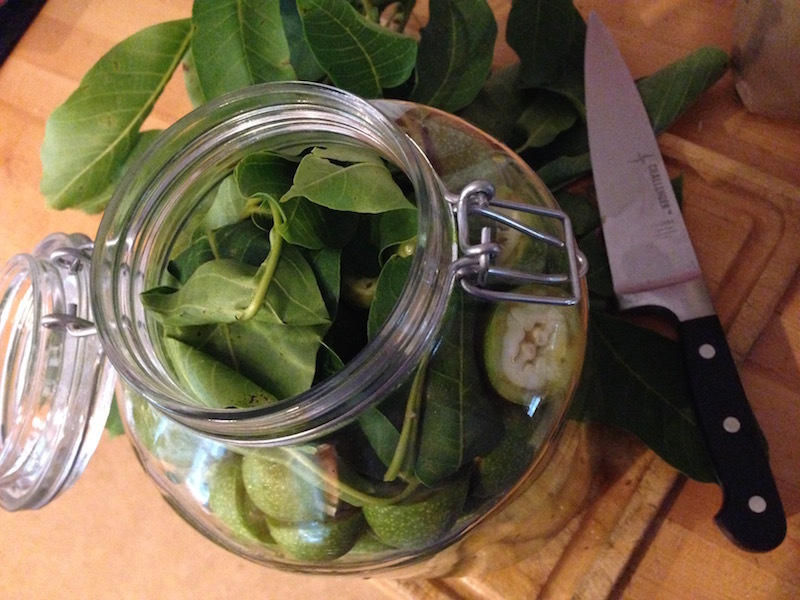 This year I got more green walnuts from Jim, adding in some I picked—with permission—from another neighbor's tree, then threw in a few leaves per Mr. Dixon's method (below). Back out onto the patio they went to sit through the summer and fall until November when I'll decant them, add the sugar and wait to find out what kind of character I'll meet next year. Halve walnuts and fill jar, adding a few leaves at the end if desired. Fill jar with alcohol and secure lid. Place outdoors. Within a few days it will look like used motor oil. 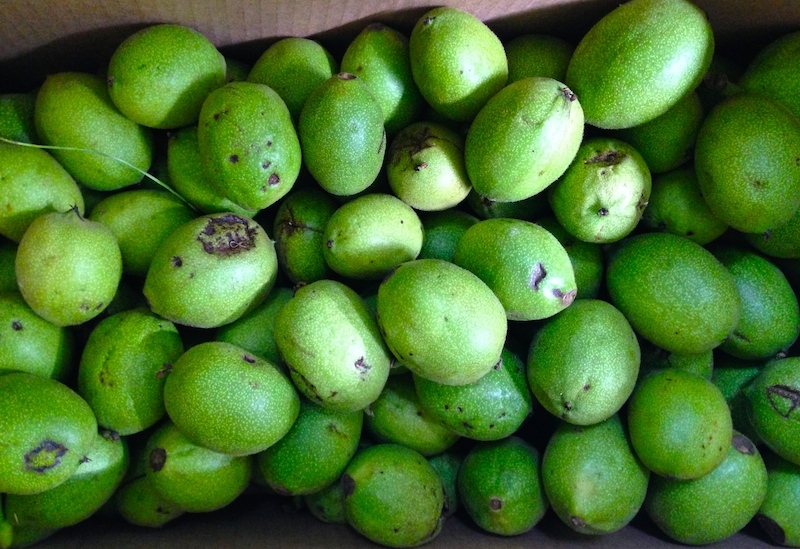 Wait at least two months—I tend to wait four to six months—then strain out nuts and leaves. 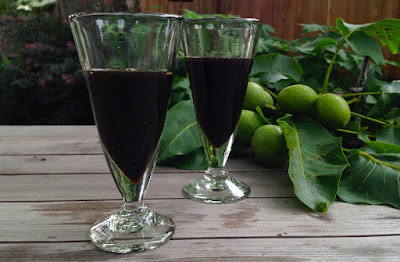 Next, Jim says, "I'd recommend diluting the walnut-flavored alcohol with an equal amount of syrup, which gives you 90 proof nocino, then trying it to see if you like it 'hot.' If not, you can add more plain water and/or syrup to dilute it down. Around 80 proof (40% alcohol) is what I like, which is 2 parts alcohol to 3 parts syrup/water." Great as is as a digestif or over ice cream for dessert. * I double this recipe, resulting in a little less than two gallons of finished liqueur. Read my post on picking walnuts with Jim and Chef Cathy Whims of Nostrana, titled "Yes to Nocino! ", and the story of my first attempt last year, "Waiting's the Hard Part." Was it just 10 days ago that I posted a photo of my baby greens? Yikes! With the unseasonably sunny and warm-to-hot temperatures, the garden has been going gangbusters. 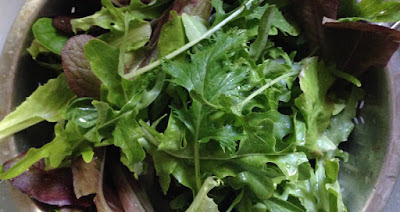 I've made two dinner salads with just the thinnings from the lettuces, the carrots are looking like they'll be ready in a couple of weeks (my 5-year-old nephew will be thrilled) and the tomatoes are growing like, well, like the weeds that also seem to thrive in these temperatures. I'm not optimistic that the remaining greens will survive the predicted steady onslaught of temps in the mid-90s that are coming for the next couple of weeks, but I'll try to preempt bolting by picking as much as I can. In the meantime, happy summer! I admit it. I'm a nosey parker at heart. There's nothing better I like than having a chance to get on the other side of the fences that keep me from seeing people's back yards and gardens. 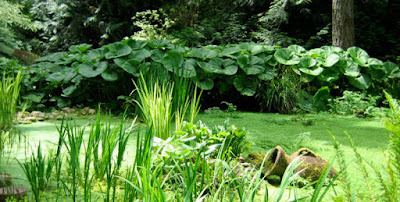 The best way to do that and not get arrested for trespassing is to go on a garden tour, and prime time for doing that in the Northwest is right now. These events are supposed to be in the service of gathering ideas for one's own meager plot, but really a part of the thrill for me is having the chance to stroll through what only friends and family normally get to see. Snoopy, as my father would have said, is my middle name. The gardeners themselves are often in attendance at these tours, so you might get a chance to chat with them if you so choose. As an example, one garden owner last weekend admitted to planting bamboo in a corner of his garden as a screen between him and a neighbor he's had issues with, knowing that the plant might just send runners under the fence, a little-known-but-used-more-often-than-you-might-think technique I like to call "Passive-Aggressive Gardening." One of the best ways to take advantage of these tours is to join the Hardy Plant Society of Oregon, which, for only $35 per year, offers its members self-guided tours of a rich and diverse array of gardens from April through October. Stretching from the coast to Bend and from the south Willamette Valley all the way north to Seattle, the featured gardens can be everything from a shade garden on a city lot in Portland, to a more rural but still gorgeous flower, fruit and vegetable extravaganza on 2 acres, to a historic garden designed by a major landscape architect. 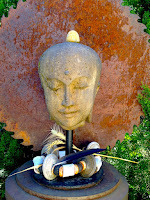 The society also offers workshops, lectures, programs, discounts at local nurseries and reduced prices on garden books. Several neighborhoods offer garden tours, including Sellwood and Foster-Powell, and there's even a bike tour of community gardens in Northeast Portland. 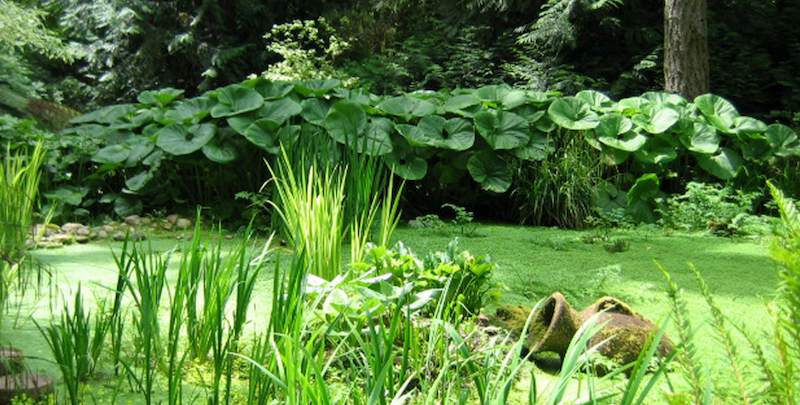 A national organization, the Garden Conservancy, offers tours in the region, and searching for "Portland Garden Tours" yielded several resources. So get out there and rubberneck to your heart's content! The Golden Boy atop the Capitol dome in Salem is feeling the heat building up under his feet. 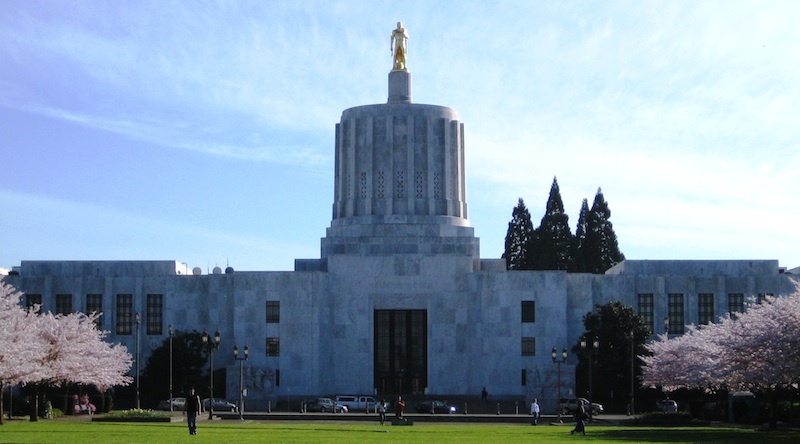 With only a couple of weeks left in the 2015 Oregon legislative session, the action is getting intense, with last-minute lobbying and buttonholing the order of the day. Several bills that will affect the food you put on your tables need action, so take a look at the short list below and let your legislators know what you think about these issues. The numbered title of each bill (in bold) is linked to an overview on the state website. 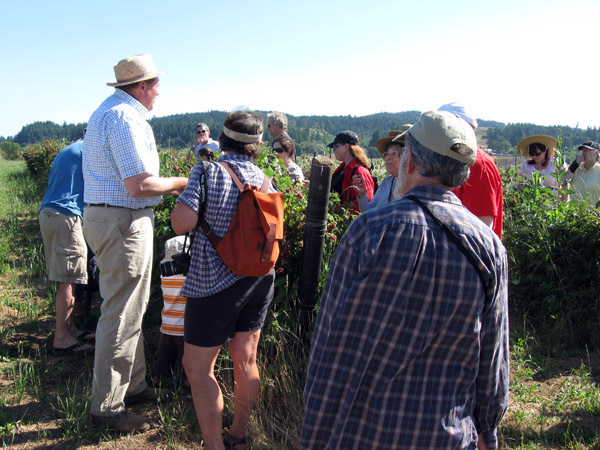 House Bill (HB) 3239: "Aggie bonds," legislation that will expand loans to beginning farmers, was signed into law by Governor Kate Brown in late May. Look for it to spur new farmers to enter the market. With the average age of an Oregon farmer at nearly 60 years old, this is a very welcome, and much needed, development. Senate Bill (SB) 341: This bill protects agritourism providers, such as farmers who have farm stay programs, host farm tours (left) or have on-farm stores, from legal liability when they invite members of the public onto their property. It passed the House last week and will be signed into law any day. SB 320: When a bill has 27 sponsors out of 30 members, you know it has a good chance of passing. This bill, allowing home cooks to produce limited amounts of baked goods and confectionary items for sale to the public without being regulated by State Department of Agriculture (ODA), was signed into law by the governor in mid-June. 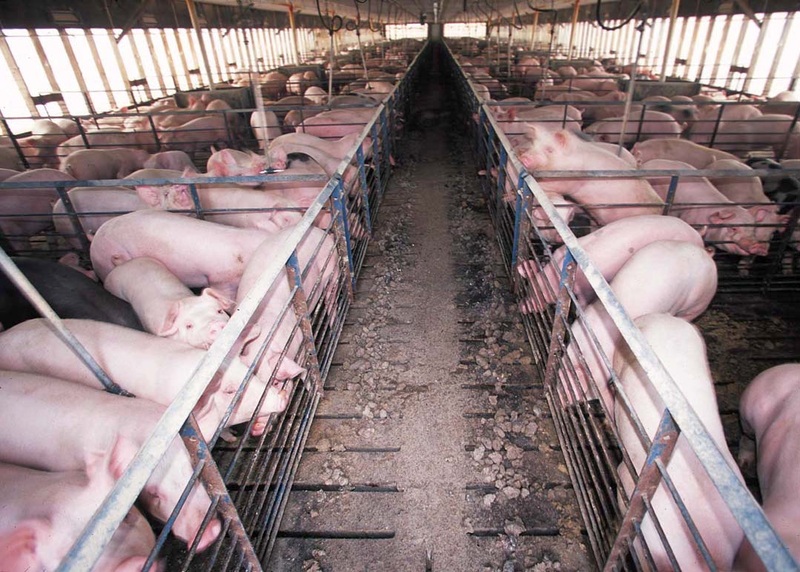 SB 920: This bill to limit the use of human antibiotics on otherwise healthy animals—a practice that factory farms (right) use to promote faster growth and keep animals alive in unsanitary, stressful and crowded conditions—is stuck in the Senate Rules Committee. This is a critical issue for public health, since abuse of these drugs by the livestock industry has created antibiotic-resistant strains of diseases that no longer respond to treatment with most antibiotics (see my post The Personal Gets Political). Click here to send an e-mail to your legislator. HB 3554: This bill would help protect farmers whose crops are at risk of contamination from genetically modified (GM or GMO) crops by allowing the Oregon Department of Agriculture (ODA) to establish "control areas" to prevent cross-pollination from genetically engineered (GE) crops. This bill is currently stuck in the House Rules Committee because of lobbying by large out-of-state corporations and needs your support to make it into law before time runs out. Let your legislator know the integrity of our food system is important to you by clicking here. HB 2723: Would provide a tax incentive for property owners to allow small scale urban agriculture for a period of five years on unused plots of land. It got a cool reception in the Senate Finance and Revenue Committee last week and may die if it isn't voted on soon. Let your legislators know that you think this incentive is a good way to incorporate more small-scale agriculture into our food system. Read the other posts in this series, Opening Salvos, The Good, The Bad and The Ugly, The Personal Gets Political and The Fight Takes Shape. Thanks to Ivan Maluski at Friends of Family Farmers for his help with the information on these bills. Our solution to the July Fourth maelstrom that turns our neighborhood into a set for a war movie has been to go camping in an area that doesn't allow fireworks. If that's not an option for you, my friend Christine Mallar, who co-owns Green Dog Pet Supply with her husband, Mike, just sent out a few suggestions for pet owners on how to help your pets through the fireworks season. Read her full post here. If you have a new dog, please don't take them with you to a fireworks display. The crowds and the very big noise and smells of the explosives can be very overwhelming to a dog, and could create a fear of fireworks where they might not have had one before. As people generally start setting off a few fireworks in the days leading up to July 4th, you can use these intermittent pops and bangs as opportunities. Keep some high value treats nearby and when you hear a pop, act like that's a really great opportunity for your dog for fun and treats! If nothing else, at least don't act like you're worried that they'll be frightened by the noises, or they might pick up on that and think they should be frightened, too. It's best to either ignore the noise or act like you think it's fun and treat-worthy. Thundershirts can be a very useful tool. These snug wraps can really help to calm and reassure dogs in stressful situations. It's a good idea to pick one up early and put it on at times when nothing bad is happening, so they don't learn to think something scary is about to start. (Dogs are pretty good at noticing patterns.) 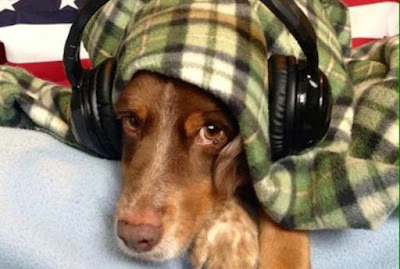 These don't work for every dog, but they can be amazingly helpful for some dogs. There are also a variety of calming treats that can be very helpful. Note: do not use Acepromazine on July 4th as it can increase noise sensitivity. On July 4th day, make sure to get all of your pets lots of exercise. Getting them tired will help them not to be so amped up over noises. Burn off that nervous energy! Keep them inside when there are fireworks going off—don't leave them outside, since they can panic and run off or be injured by people playing with fireworks. Offer dogs something new and exciting to chew on that night, since chewing often helps dogs deal with stress. Turning on some white noise or music, or even the clothes dryer or a noisy dishwasher can be helpful to drown out the fireworks noise. Are your ID tags current? Make sure that every pet, perhaps even your indoor cats, are wearing their tags. Fearful animals can often bolt for the door, and many pets are lost every year. There's still plenty of time to order a fresh ID tag. Here's hoping everyone in your family has a safe and calm holiday. Oranges. Vegetables. Flowers. Nuts. None of these everyday items we take for granted would exist without the pollinators that make it possible for these plants to reproduce. To put it in perspective, it's been estimated that pollinators are responsible for one out of three bites of food we humans eat. This week, June 15 through 21, is National Pollinator Week, a few days to appreciate these creatures and the huge part they play not only in our survival, but that of the planet. Responsible for the reproduction of 85% of the flowering plants around the world, they're critical for pollinating the plants that become food or habitat for other species. In addition, they themselves are a source of food for many birds and other wildlife. Plant native milkweed to help create monarch butterfly habitat. Buy organic products whenever possible and talk with farmers at the farmers' market about what they do to create pesticide-free, flower-rich habitat on their farms. 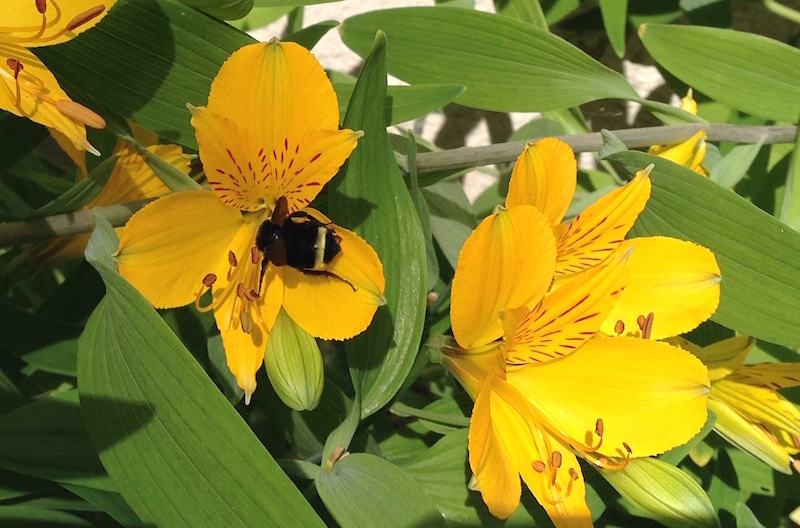 When buying nursery plants for your garden, look for labels that say they haven't been treated with bee-killing pesticides like neonicotinoids. For more information on pollinators, check out the Xerces Society, an organization dedicated to researching and the protecting pollinators and other invertebrates. Read more about the dangers of neonicotinoid pesticides. 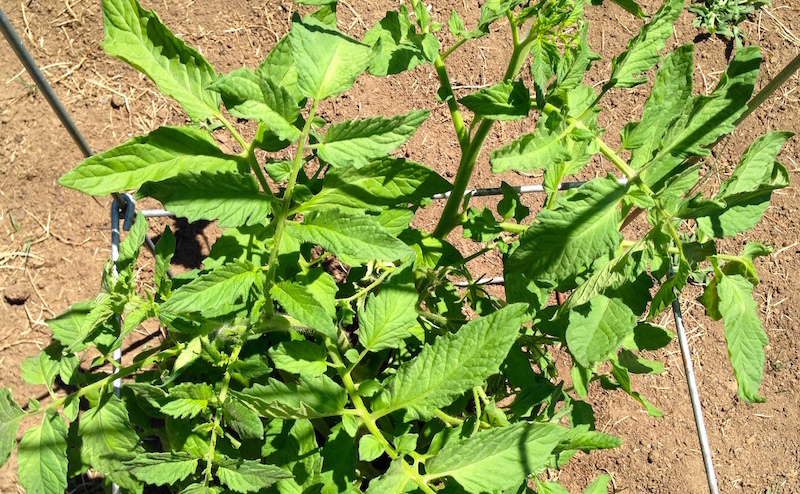 A very happy Sungold cherry tomato plant. If you're a newcomer to our fair city, you may not even have been aware that it was happening, but if you needed any more proof that climate change is real, you had only to look up at the sky during Portland's annual paen to the be-thorned flower that gives this place its nickname, The City of Roses. You could look up because there wasn't anything falling out of the sky that would cause your eyes to blink and your head to get soaked. 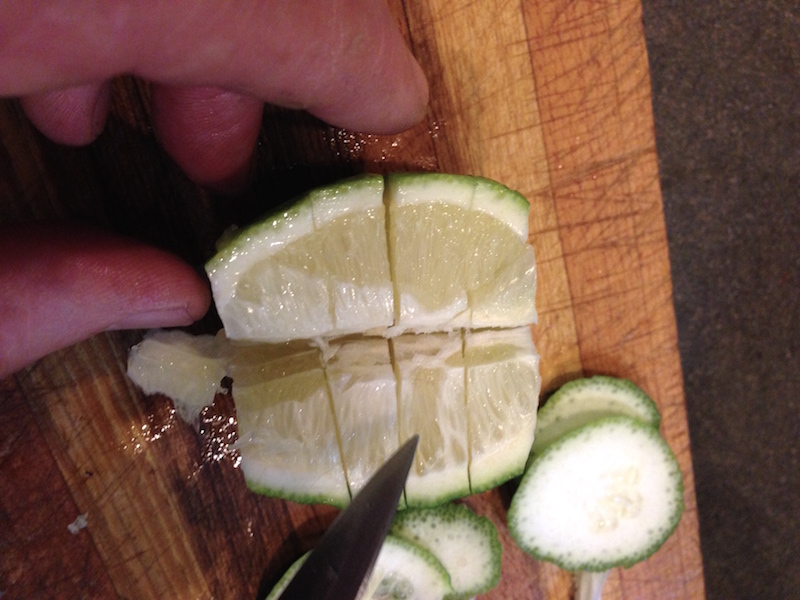 Remove pith from lime, then slash. There wasn't even a reason to wear a coat because the temperature was hovering in the 80s and the sky was the crystalline blue of some tropical lagoon. The roses themselves, which started blooming almost a month ago and which normally would be sodden masses from the drenching rain that falls from the sky in torrential sheets during the Rose Festival, were blooming in profusion on even the most hellish of hell strips. That and the lack of snow pack in the mountains is enough to make native Oregonians more than a little nervous. Put lime in glass and add superfine sugar. But we're a plucky lot here, so when the sun shines and the mercury creeps up into the high double digits, we take a cue from the parts of the world where this kind of weather is de rigeur. And since this week is looking to be quite tropical, we'll be mixing up just the right blend of ice and lime and a splash of alcohol. No, in this instance I'm not talking about a margarita or a gin and tonic or even a mojito—not, as Mr. Seinfeld would say, that there's anything wrong with those. 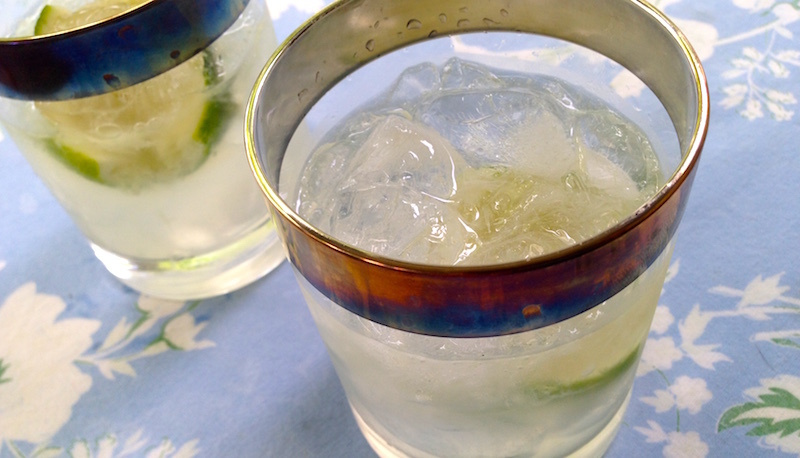 We're currently enamored of the national beverage of Brazil, the caipirinha (pron. kye-peer-EEN-yah). Made with cachaça (pron. kuh-CHAH-suh), the slightly sweet, sprightly liquor made from the fermented sugar cane juice that is then distilled, it is a drink at once light and refreshing. This is especially called for on hot days when you don't want a cocktail hammer upside your head, but instead something that is cold and sippable and makes you feel like you're sitting under an umbrella on the beach. If anything can make hot temperatures, or climate change, more bearable, it's this. Trim ends off lime so white rind is gone. Cut lengthwise and remove pith from center. Slice almost all the way through perpendicular to axis of lime, leaving rind side intact. Slice diagonally a couple of times, again, not slicing through. Cut in half, perpendicular to axis and put in glass flesh side up. 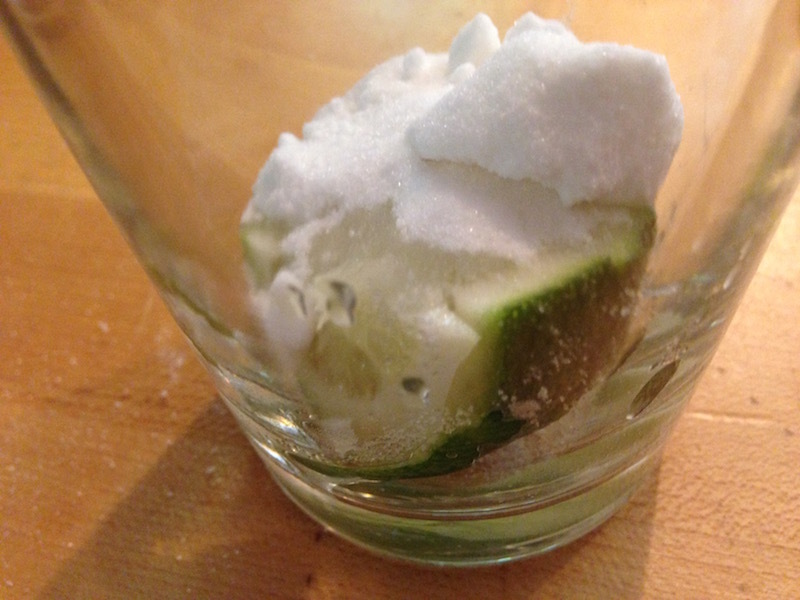 Put sugar over lime. Muddle gently, squeezing out all the juice you can. Put into shaker. Fill with ice. Add the cachaca. Shake. Pour with ice into tumbler. Check out another perfect spritzy cocktail, ideal for summer, the Americano. In the most recent newsletter from the Beaverton Farmers' Market, market manager and gardener extraordinaire Ginger Rapport shared a comprehensive and useful guide to the history and culinary uses of that spiky-on-the-outside, tender-in-the-middle seasonal treat, the artichoke. They are well-adapted to our moderate climate in the Northwest, and they can be found in abundance at farmers' markets in the area. We have often wondered what made someone look at an artichoke plant and decide to try to eat it. After all, they are fairly intimidating with their spiky leaves and scratchy choke. It must have been someone who was very hungry! Unlike a carrot, which is a fairly straight forward vegetable, an artichoke has secrets that you need to know in order to enjoy them. History: Artichokes are members of the thistle group of the sunflower family. The edible portion is actually the plant’s flower bud. Artichokes date back to the time of the Greek philosopher and naturalist, Theophrastus (371-287 B.C.) who wrote of them being grown in Italy and Sicily. Ancient Greeks and Romans considered them a delicacy and an aphrodisiac. They also believed that artichokes were effective in securing the birth of boys. Cultivation of artichokes spread across the Mediterranean and French immigrants brought them to the United States in the 1800s. It was in the late 1800s that Spaniards brought them to California which today grows nearly 100% of all artichokes grown commercially in the U.S. Fortunately for us, Denoble Farms in Tillamook grows them and brings them to the Beaverton Farmers Market. Basic Artichoke Preparation: Have a cut lemon handy because you will need to rub it on any recently exposed surface of the artichoke to keep it from darkening. Squeeze the remainder of your lemon into a large pot of boiling salted water. Add the prepared chokes and cover with a white dish towel to help keep them submerged. Depending upon the size of the artichoke, it will take anywhere from 30 – 45 minutes to cook. To test for doneness, pierce the stem end with a fork. When properly cooked, you should get a little resistance against the fork. If it pierces too easily you have probably cooked them a bit too long. Remove from water and drain upside down in a colander. At this point they can be eaten immediately or refrigerated for later use. 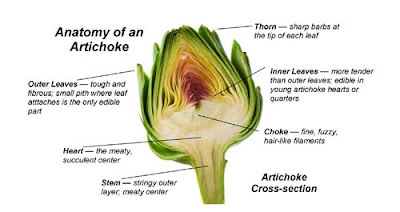 Eating An Artichoke: Peel off a petal and notice the soft part at the base. This is the only part of the petal you will be eating until you get closer to the center where the petals become more tender. If you want to dip the bottom of the petal into a sauce or dressing, now is the time. Pull the petal through your teeth removing only the soft, pulpy part at the bottom. Work your way around the artichoke until all of the petals are removed. 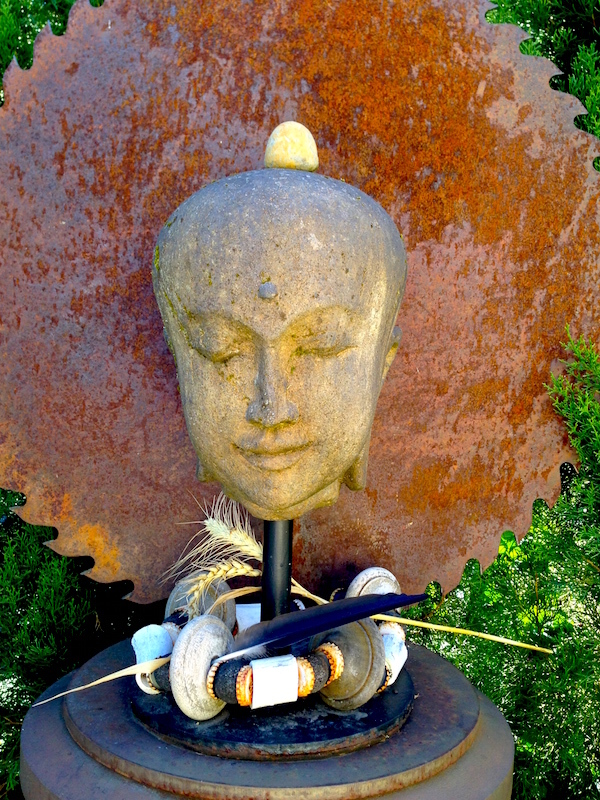 As you work your way towards the center, the texture of the petals change. You may or may not enjoy eating them at this point in which case you can just pull them off and discard them. You will be left with the artichoke bottom, topped with the inedible choke. 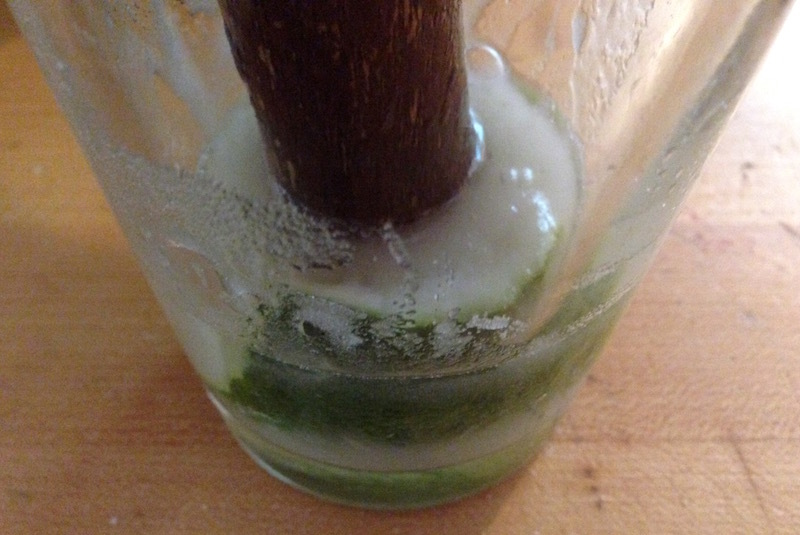 Using a tablespoon, scrape the fuzzy choke off of the bottom. It is very obvious where the choke stops and the bottom begins. It is the bottom of the artichoke that you want to eat. Typically it is served with melted butter, or some kind of dip or dressing. It can be eaten hot or cold, or cut up and added to other dishes such as salads, pastas and eggs. Artichokes have a bad reputation for being fattening because they are usually served with a mayonnaise based sauce or butter. A large artichoke is only about 25 calories so it is only as fattening as what you are serving with it! Selecting an artichoke: Globe artichokes should be heavy for their size and have a tight leaf formation. 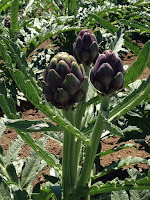 Avoid artichokes which are wilting, drying or have mold. 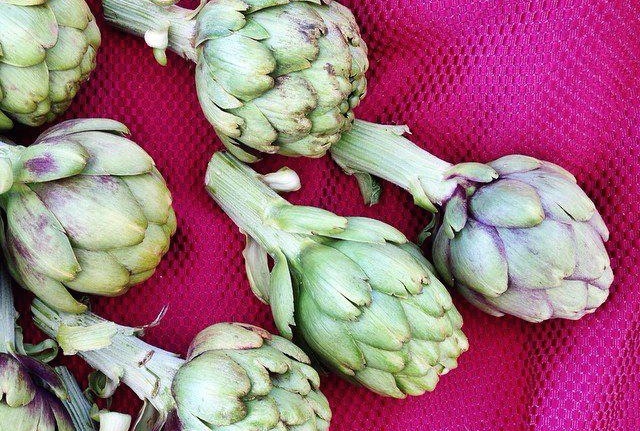 Both raw and cooked artichokes can be stored in your refrigerator for up to a week. Photos from the Beaverton Farmers' Market. It started two years ago when farmers in Jackson County, a largely agricultural region in Southwestern Oregon, found out that for the past decade, genetically modified (GM or GMO) sugar beets had been grown for seed in the county. Moreover, the locations of the 40 fields were being kept secret by the growers. The problem for some local farmers was that since these sugar beets were being grown for seed, this meant that the beets were being allowed to flower and develop pollen. The pollen from the sugar beets (left), which one EU study showed can be carried on the wind as far as five miles from the source, could also be picked up and carried by birds, insects, cars and trucks for much greater distances. The pollen from the sugar beets has the potential to cross-pollinate with any member of that family, including table beets. Contamination means that crops can't be sold by organic growers and, even for traditional (non-GMO) farmers, it makes their crops undesirable to a public increasingly opposed to buying what they consider tainted food. This led to 150 Jackson County farmers, who felt their crops were endangered by contamination from genetically engineered (GE) crops, to initiate what became known as the Jackson County Genetically Modified Organism Ban, Measure 15-119. 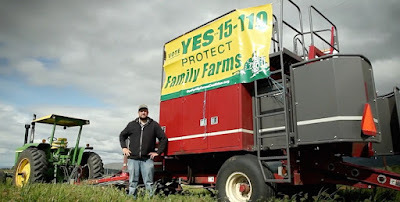 The measure passed with the support of 66% of county voters despite almost $1 million spent to defeat it by agricultural companies that produce and promote the use of GE seed, including Monsanto, DuPont, Syngenta, Bayer and other chemical corporations. The measure was quickly subjected to a court challenge by two farmers in the county, backed by those same chemical corporations, who grew GE "Roundup Ready" alfalfa, citing Oregon's Right to Farm Act which "protects growers from court decisions based on customary noises, smells, dust, or other nuisances associated with farming. It also limits local governments, and special districts from administratively declaring certain farm and forest products to be nuisances or trespasses." The suit, which sought to overturn the measure or award damages in the amount of $4.2 million, was dismissed on Friday, May 29, by federal magistrate judge Mark D. Clarke, who ruled that the Jackson County ban was allowed under the Right to Farm Act. According to Judge Clarke's opinion, the act was intended to "protect against damage to commercial agriculture products, and therefore it falls into the exception to the Right to Farm Act." Furthermore, Judge Clarke wrote, "Farmers have always been able to bring claims against other farmers for practices that cause actionable damage to their commercial agriculture products. The [Jackson County] Ordinance, by contrast, is enacted pursuant to section 30.935 [of state law], and serves to prevent such damage before it happens." Jackson County farmer Chris Hardy was quoted in a press release as saying, "No farmer should ever have to tear up their crops like myself and others did for fear they had been contaminated by GMO pollen. Family farmers know well that GMO contamination could quickly destroy a family farm, but it was so encouraging to have a federal court support farmers’ right to defend ourselves against GMOs." Get the full text of Judge Clarke's decision. Sources for this story included the Center for Food Safety, Ballotpedia's explanation of the measure and an article on Alternet by Steven Rosenfeld. 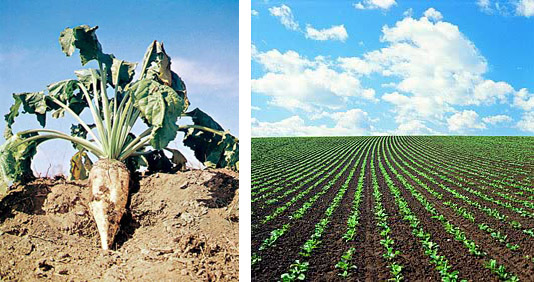 Photo at top from a video produced by Our Family Farms Coalition.